Windows 8 is a beautiful OS, it has many advantages over previous OS but it also has it’s own drawbacks. One such draw back is Shut down button in windows 8 operating system. It’s really hard to shut down in windows 8 OS. By default we have to click at least 3 buttons to shutdown. In this post I will show you some of the best practice to quickly shut down your windows 8 O.S. By default we can shut down by invoking the Charms bar (win+C) >> Settings >> Power button >> then Shut down. Definitely this is not the easiest way to shut down. Currently I’m using windows 8 on my laptop. If you are also using windows 8 on your laptop, then follow the below tip. Right now I modified my laptop power button to shut down instead of sleep. Why because I don’t use sleep option much on my PC. So instead of that I modified it to shut down button. 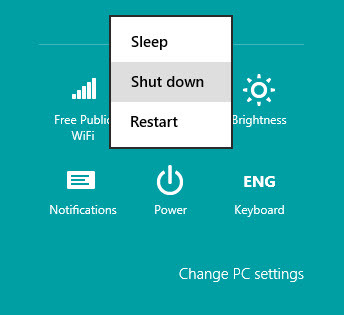 If in any case you need sleep option, then you can access it through Charm bar (win+c) >> Settings>> Power button >> Sleep. To modify Power button to Shut down button, go to start screen by pressing windows key, and search for “Change what the power buttons do” option and open it. In that new window you will see “When I press the power button” option. Modify both option to shut down values by choosing Shut down in drop down menu and click Save Changes button. Now every time you press power button it will shut down you laptop instead of going to sleep. You can only implement this tip on your laptops but not on your desktop PC. 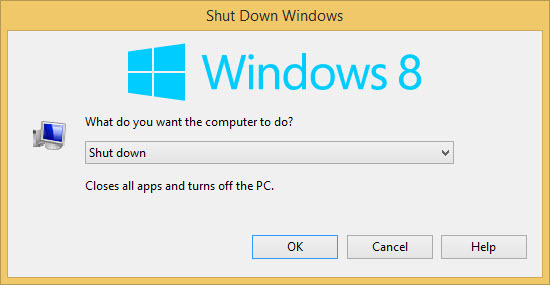 There are many other ways we can easily shut down our windows 8 PC. You can try below methods as well. Whichever suits best you can adopt that style. Many user forget this old style of shutdown option. 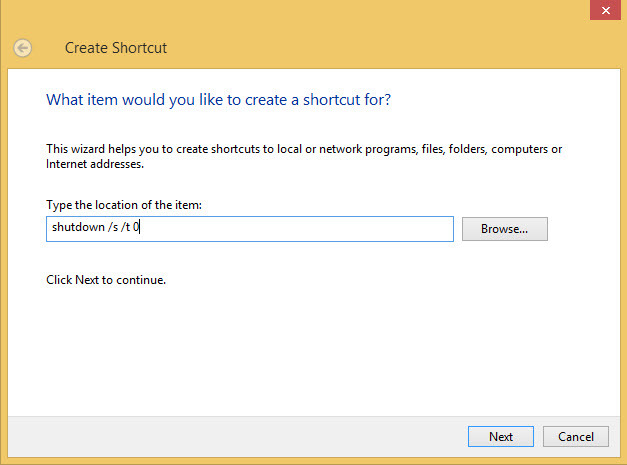 We can use this short cut key still on our windows 8 O.S. When you press Alt+F4 button on your keyboard, it starts closing all your opened application and give shut down option. If you minimized all your windows that time it directly prompts shut down option. One more easiest way is by creating shortcut to shut down button. This is also one the best way to to shutdown our windows 8 operating system. 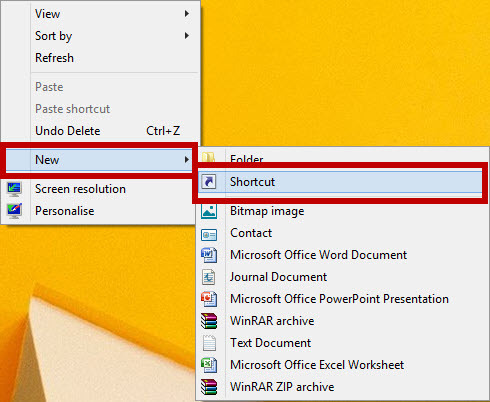 To create shortcut button go to your desktop right-click and choose New >> Shortcut. and click Next and in the next window type Shutdown and click Finish. 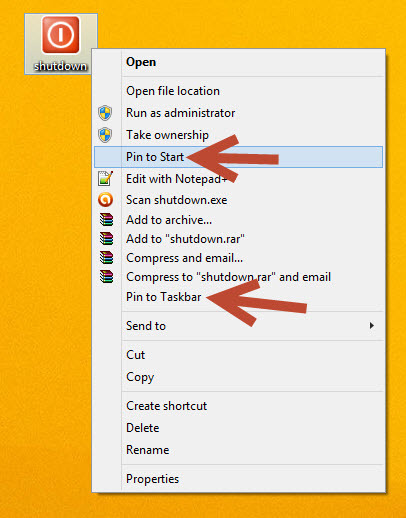 Now you will see shutdown shortcut on your desktop. To change icon, select that icon and right click and choose properties. In Shortcut tab click Change Icon.. button and now you choose any icon you want and click apply and OK button. 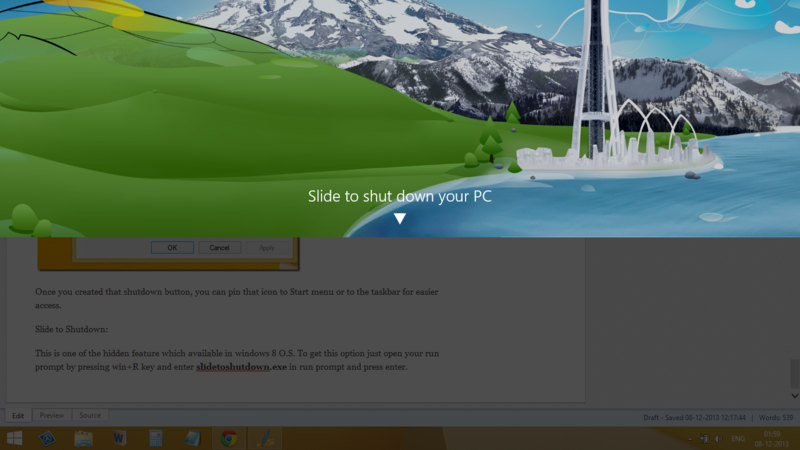 Once you created that shutdown button, you can pin that icon to Start menu or to the task bar for easier access. To pin, select the shortcut and right click and choose Pin to Start and Pin to Task bar option. This is one of the hidden feature which available in windows 8 O.S. To get this option just open your run prompt by pressing win+R key and enter slidetoshutdown.exe in run prompt and press enter. Once you slide the screen windows will shutdown. Most user thinks that we have to use mouse or our hand to slide that screen. But it’s wrong, once you are in that screen just press Enter key on your keyboard to automatically slide that screen to shutdown. Tip: You can also create shortcut to your slide to shutdown method. Follow the above procedure, in location enter slidetoshutdown.exe. Currently these are the some of the ways we can quickly shutdown our windows 8 OS. For me, the first method is what I’m using now. So what’s your choice to shut down?